Where: CenturyLink Field, Seattle, Wa. The Union have a lot to bounce back from after a 4-1 loss to Montreal on Saturday. 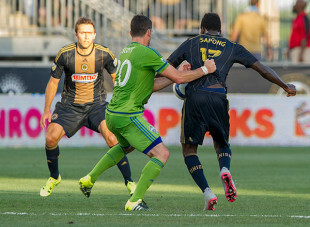 It was a rough one: The five-match unbeaten streak was snapped, at home no less, and the Union weren’t looking too sharp, to put it politely. Just to rub a little bit of salt into the wound, the Seattle Sounders have been hot recently, as in nine-match winning streak hot. It’s going to be a tough one. But aside from Saturday’s game, the boys in blue have been performing quite nicely recently, playing the best soccer we’ve seen from them in a long time, possibly ever. With the U.S. Open Cup final in just one week, Jim Curtin can either decide to rest his team or try to boost his team’s morale tonight. Saying that Seattle is hot right now is a bit of an understatement. Not only have the Sounders won their last nine matches, they’re unbeaten in their last 12. That’s an MLS record in the post-shootout era. Seattle has more than a few players that are playing the best soccer of their careers right now. The club certainly doesn’t seem to miss Clint Dempsey. Let’s start with Seattle’s goalkeeper, Stefan Frei. He currently leads all goalkeepers with a 0.96 GAA and has a 78.4 save percentage. Improving every year with the Sounders, Frei’s on track for his best season yet. Seattle’s defense has come a long way this season, but they finally got it all together and are proving to be impenetrable at times. In fact, the Sounders have allowed just seven goals since July 1, never giving up more than one goal in a match. The Union need to watch for the quick counterattack, the Seattle back line’s specialty. Last, but certainly not least is Raul Ruidíaz. The newly acquired striker scored both goals for the Sounders against the Whitecaps on Saturday, both in the first half. In 759+ minutes with Ruidíaz on the field this year, Seattle averages 2.3 goals per 90 minutes. Combine him and Nico Lodeiro’s ability to set up amazing plays, and you’ve got a deadly combination. Seattle plays a 4-2-3-1 like the Union. However, they’ve been sticking with the same lineup for the last four straight matches. The Sounders are more than likely looking ahead to their match on Sunday against the Galaxy, a chance to get some points and set them apart in the Western conference. Aside from Saturday’s game, the Union have been looking sharp. Quality chances have been capitalized on, the back line has looked pretty solid, Andre Blake is still being Andre Blake. The Union were unbeaten in five matches for a reason and have been moving nicely into playoff position. No, the Union couldn’t click and generate any real chances against Montreal. No, the defense couldn’t stop the counterattack on two occasions. Yes, the Open Cup final is in just seven days. Will the Union try for all three points again the Sounders? Probably not. Of course, points are important, but looking at the table now, the Union are in the playoffs at 5th place. Really, after the last match, the Union need to be in a good headspace. They need to move past a loss at home and keep moving forward. Curtin will probably give his top starting XI a bit of a break tonight, or at least sub the top three off after a bit. It’s possible that Dockal didn’t even travel to Seattle for the match as he comes back from his ankle injury. Maybe Kacper Przybylko will get his feet wet tonight. Cory Burke, who seems to score almost every game might make an appearance, in more ways than one if he’s given the time. A 4-2-3-1 lineup is pretty standard for the Union and will probably continue tonight, as will Sapong on the wing, it just works. Ruidíaz can score. He’s a finisher, and he’s finished some beauties this season. The real question is can the Union’s back line buckle down enough to stop him and Nico Lodeiro’s playmaking abilities? Can Blake be Blake against someone who’s doubled his team’s average goals per game? If the Union can stop Seattle’s counterattacks, there’s a chance Lodeiro and Ruidíaz won’t be a probem. Burke can score too, we’ve all seen it. But the Sounders’ back line is going to be tough to crack. If Burke can be fast and in the right spots, he can score. It will be interesting to see if he can test them to hit the back of the net. Home field advantage is real in this match-up. The Union shut out the Sounders in both 2015 and 2017 with home field advantage, but in both 2014 and 2016, The Union lost 2-1 in Seattle. With the possibility of the Union’s B squad taking the field tonight and this match-ups history, a 2-1 loss is predicted. I’ll go with Seattle 5-0 since it really should be closer to Seattle Sounders vs. Bethlehem Steel. I am still foolish enough to plan to stay up for it though and take tomorrow off. Thanks for jumping in and giving this match preview a go; well done! Unfortunately I think it will be closer to 3-0 for Seattle. Think they will dominate us. We may have a chance if Sapong is rested and Curtin starts 2 fast wingers to catch Seattle on counter attacks. I say a group of Union B squad guys hang in there and it ends maybe as a 3-1 loss… with it being 1-1 at some point in the 2nd half. A respectable effort, with much more important games ahead. I’ll be that guy too…. laboring the love. Suffering Friday for the choice I make tonight. While I fully recognize that legally Ernst Tanner remains only a consultant, he is physically here, and I would suspect that the consultant’s word carries the same weight pragmatically as if he were actually the official Sporting Director. My point is that this will be the first time his eyes will be live on an away match, and it may be the first time on any match since I do not know whether he was here for the Montreal game. He has four Bethlehem games available to watch, two of them home, and seven Union, three home. He has a short time to decide whether to follow the recommendations I am assuming Earnie Stewart left him for end-of-season roster decisions. He will have had input into tonight’s lineup, and while it is clear his commitment is to win, the consideration above will secondarily influence the lineup choice. WE have already learned that he is willing to sign a 25 year-old who may not be a candidate to be a major starter. Earnie at best hit .500 on major starters, but he did not sign 25 year-old “benchies.” A subtlety, for certain, but perhaps a difference. this match will be on the TV. whether it gets full attention or consciousness remans to be seen. steal a point is the best i’m hoping for. The match-up of the game will be Alonso against whoever starts at the 10. With Dockal probably not at 100% and potentially not even traveling, and Fontana still out, it will be interesting to see how Jim handles things.